FAQs - Decorative Concrete, Inc.
How long has acrylic spray coating been in use? Acrylic resurfacing has been in use since the early 1970s. Polymer was added in the 1980s to provide superior bonding properties, as well as increase strength, durability and longevity. 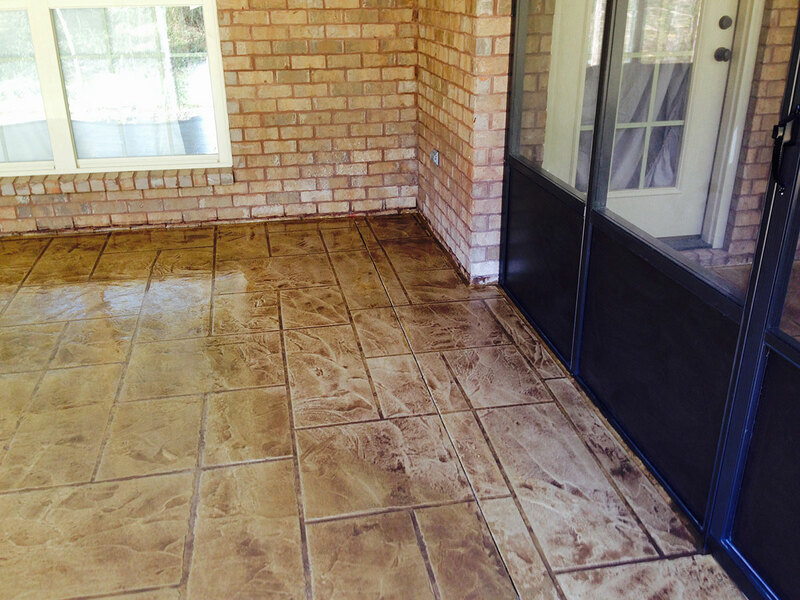 How long does stamped concrete or acrylic spray coating last? If properly maintained, these will last virtually a lifetime. They are easily repaired at any time during their useful life.We highly recommend you reapply the sealer at least every three years. How durable are the different materials and surfaces? All of our products are made to withstand foot and vehicle traffic. Some coatings such as epoxies are more suitable for heavy traffic such as forklifts in warehouses. Are your coatings affected by cold weather? No. Our most popular coating is an acrylic, which remains flexible, yet extremely durable, allowing it to move with the contract during freeze/thaw cycles. How does acrylic spray coating bond to concrete? First, the surface is pressure washed to clean off dirt. A very thin “skim” coat of the acrylic cement mix is applied by trowel, providing maximum absorption into the pores of the concrete. Patterns are created using reinforced tape when the skim coat is dry. The “highlight” colors are applied using a drywall hopper in a random spray pattern. When this coat is dry, the tape is pulled, revealing the pattern(s). The final part of the process is to apply an even, thin, coat of solvent-based sealer using a paint roller. This sealer coat penetrates and softens the skim and spray coats while bonding all layers to the concrete. When dry, these two layers become a permanent part of the existing concrete, providing outstanding weather and stain resistant properties. How thick is the acrylic spray coat applied? Total thickness is approximately 1/8 – 3/32″. We are more concerned about getting the acrylic to penetrate the concrete than building up the surface. Actually, the thinner it is, the better the flexural properties it has, this is very important to allow for expansion and contraction of concrete during freeze/thaw cycles. What are the color choices for your stamps, coatings, and pavers? 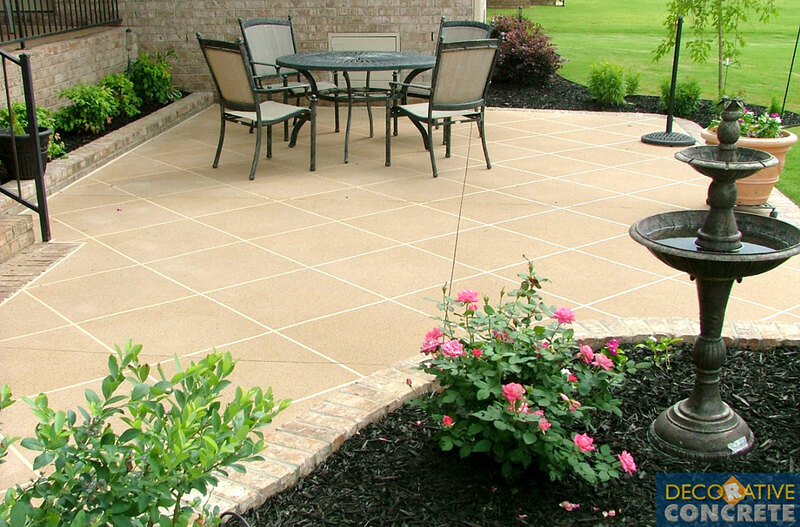 Stamped concrete is available in wonderful colors suitable for homes today. We currently have more than a dozen standard and highlight colors from which to choose for the acrylic spray coating. Our unique highlighting system provides virtually unlimited color combinations. Custom colors and personalized logos are available at an additional cost. Epoxies have about a dozen different color and flake color combinations as well. Acids, washes and stains tend to stay in just a few color families, but can be adjusted to go with the colors used in most homes today. Pavers also come in a wide variety of colors. We’re happy to bring samples out when we visit for our FREE on-site assessment – just ask! If properly maintained, these will last virtually a lifetime. They are easily repaired at any time during their useful life. We highly recommend you reapply the sealer at least every three years to maintain the durability and beauty of your surface. How do the coatings stand up against oils, stains, salts, and discoloration? Because of the protective properties of the sealer coat, it is a non-porous finish. The majority of stains due to oil and grease wash off with mild detergent. Salt, de-icers, fertilizers, and such have no effect on it whatsoever. In addition, because of its unique ultraviolet additive, it will not discolor due to exposure to sunlight, even in the harshest of conditions. Can acrylic spray be applied around pools? Most definitely! Acrylic spray is the ideal solution for pool and spa areas. 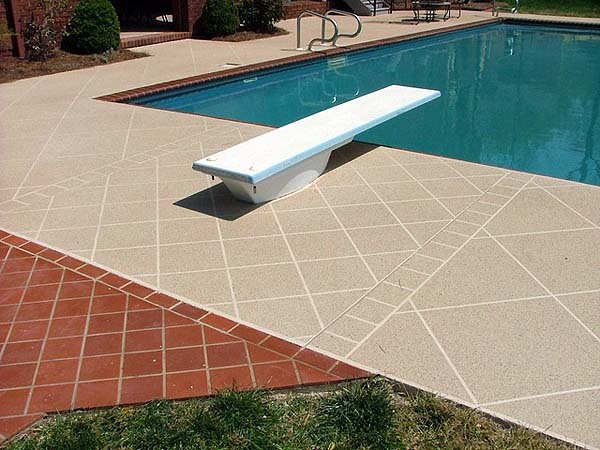 It is non-skid, cooler than concrete, and will not stain or be adversely affected by pool chemicals. 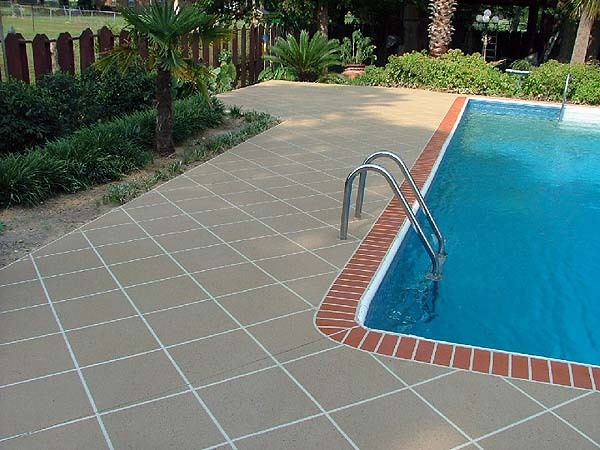 It also provides a perfect transition from pool to yard and adds a finishing touch no other product can. Should my cracked concrete be repaired or replaced? A lot of factors go into a recommendation for repair or replacement. Our experienced team will visit your site to assess the situation, consult with the appropriate team members, then provide a recommendation along with an estimate. At Decorative Concrete, we can provide total concrete solutions from fresh concrete to repairs and coatings. We’ll provide you a recommendation that’s best for your situation, not what’s best for our sales. What’s the best way to maintain concrete coatings or stamped concrete? Periodic washing is all you should have to do to maintain your new surface. Clean oil spills and the like as quickly as possible to keep it looking new. We recommend resealing every three years to achieve maximum durability and appearance. This resealing process is very inexpensive and can be done by the homeowner in just a few hours. Expansion joints and cold or control joints are necessary to prevent cracking of the concrete. Concrete must be allowed to expand and contract with temperature changes. These joints provide a “controlled crack” for this movement. All expansion joints are left in place, we cannot cover them up. We also recut all existing joints a little deeper to ensure that when it does move, it moves where we want it to and not at some undisclosed weak spot. How quickly can we use our new patio, driveway, pool deck, garage floor or basement? We work hard to make sure you are inconvenienced as little as possible. With pavers, you can drive or walk on the new areas as soon as we have everything installed. With concrete coatings, there is some drying and curing time involved but you can walk on them 24 hours after we are finished. We recommend keeping vehicles off of coated surfaces for 5 to 7 days. Absolutely! All of our products carry a one year limited warranty against excessive fading, delamination, and product failure. We highly recommend you reapply the sealer at least every three years. This warranty does not cover the crack repair process and any sub sequential damage to the surrounding decorative coating, spalling, deterioration of the concrete substrate, any repair process to the concrete substrate, or surface water runoff.